* Fennel – 1 bunch – Most people think of this as a “love it or hate it” veg. But when you cook fennel, it looses a lot of its “licorice” flavor and mellows out so nicely. * Red Romaine Lettuce – 1 head – Make a huge Caesar salad for dinner and top it off with some chicken or tempeh or shrimp…. the heads are so large that you’ll have enough to feed the neighbors too! * Toscano Kale – 1 bunch – This is the kale variety that you’ll most likely be familiar with. Also known as “dinosaur” kale, the leaves are sturdy. Cook them in a soup to soften them to taste. Try the delicious White Bean & Kale soup recipe listed GEOF’s website. * Escarole – 1 head – This looks a lot like a head of lettuce, but look carefully and you’ll notice that it has frilly leaves and a white center. The flavor is usually slightly bitter, but the growing conditions have been ideal and its bitter flavor is very mild. Traditionally, the inside leaves are best for raw salads (it pairs wonderfully with gruyere cheese) and the outside leaves are delicious cooked or in soups. 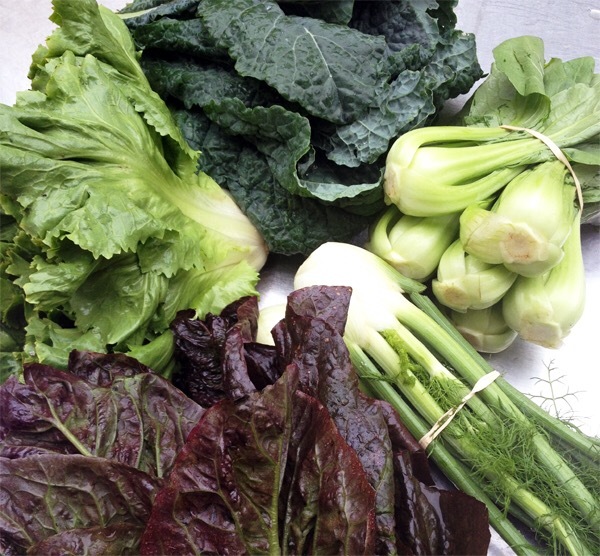 * Bok Choi – 1 bunch – There are so many ways to prepare bok choi. Throw it in a stir fry, or try roasting it! Pickup on Tuesday at ALEWIFE, from 5pm – 7pm.